This month’s shoe is actually a flat. It is A/W 2012 and already on sale, but still. 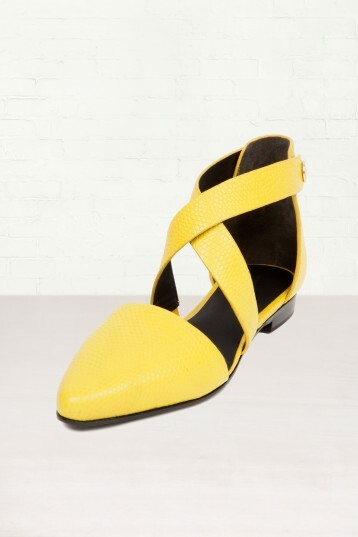 The use of an almost-construction-yellow combined with the cross-bracing at the ankle have put this Alexander Wang Tabea shoe at the top of my list this month. In a sea of boring, comfort-driven flats, this one really stands out in terms of both form and function. The impressive lizard-embossing excites my tactile nature and the studs that tie together the cross-bracing give it a slightly hard edge. Well done, Mr Wang.